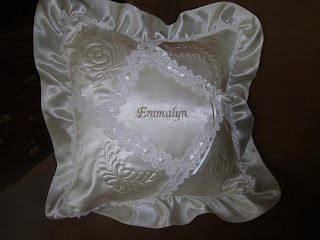 This pillow was created using Emmalyn’s Great-grandmother’s wedding gown, which had so yellowed with age, there was no way to create a gown, but Angie wanted to give her something to remember her by, so she machine embroidered her name and decorative touches onto the satin, using the ruffles and used the lace from Emmalyn’s Grandmother’s gown (also used in her own gown). I think this is a beautiful way to give tribute to the important women in her life. 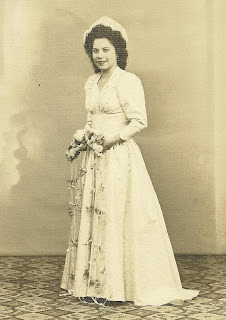 I also think Great-grandma would have approved. Angie–you’ve outdone yourself!